Sephora fans check your emails today! We've got advance heads up on the Sephora annual Holiday Beauty Insider Event! Save 20% off your Sephora order in-store and online during this event! Woohoo! Please note when you can shop the sale depends on your Beauty Insider membership level, please note the different dates and discounts (VIB/Rouge get 20% off, while Beauty Insiders get 15%) below! 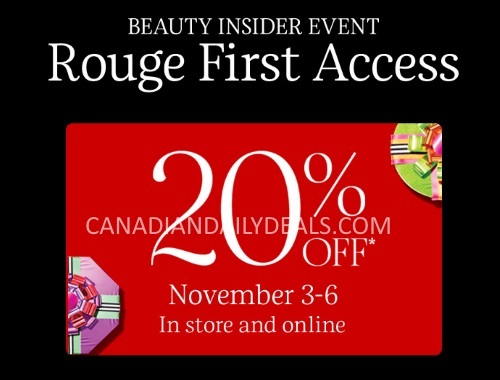 VIB Rouge First Access - November 3-6 online and in-store with the promo code 20FORROUGE (also get a Free Holiday Tote in-store on November 3 and you can shop with a friend and they get the 20% off discount too!). I am VIB Rouge and got my "save the date" invite earlier today! So excited that we get two chances to shop this sale, start planning your list now!